An original letter of correspondence between brothers and business partners Joshua Coffin Chase and Sydney Octavius Chase. Topics discussed in the letter include Joshua's visit to Isleworth Grove, his decision to produce the regular Isleworth Grade, the lack of damage to trees from dry weather, and the Roadway Department's estimates for constructing a new road. Original letter from Joshua Coffin Chase to Sydney Octavius Chase, May 4, 1927: box 49, folder 20.84, Chase Collection (MS 14), Special and Area Studies Collections, George A. Smathers Libraries, University of Florida, Gainesville, Florida. Digital reproduction of original letter from Joshua Coffin Chase to Sydney Octavius Chase, May 4, 1927. Tried to reach you this morning from the house but found that you were not expected back until some time this afternoon. Hope you had a comfortable trip and all hands returned in good trim. I visited Isleworth this morning and found the fruit coming to the house was of good texture but mostly Bronze or Golden, with a small percentage of Bright. I talked the matter over with Hutchinson and finally decided to make the regular Isleworth Grade, which is being packed under Chase Brand, and the same grade in golden or bronze, also packed under Chase Brand. This will make the cars going out Chase grade and Chase grade golden. The balance will be Coat of Arms. There may be six or eight hundred boxes of this grade of fruit. I did not visit where the picking operations were going on as I was there last week. The fruit is still over-running the original estimates. I instructed the picking force to pick the Valencias on the island as long as they have their field boxes and ladders down there in that part of the grove. This will make the final picking of Valencias from the block east of the packing house. I did not see Browne, but drove over the property, branching off from the bungalow for over the hill and back along Lake Laura. None of the trees showed any indications of suffering from dry weather. Neither did any of the trees on the groves along the road show any wilt. Noah appeared to think that Browne and his force were doing a very good job in giving the ground a good wetting. do not stop at anything when they want something. He also made the statement that the Windermere route is the route favored by Browne. Noah also wanted to see you concerning the cost of clearing two tracts of land, as he thought it would be advisable for you to have the cleared land remeasured and then determine something about costs. Will explain this to you when we meet. Chase, Joshua Coffin. 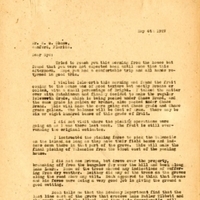 “Letter from Joshua Coffin Chase to Sydney Octavius Chase (May 4, 1927).” RICHES of Central Florida accessed April 25, 2019, https://richesmi.cah.ucf.edu/omeka/items/show/2731.